The evolutionary temperament that is increasingly common to the artists of intersections between neoclassical and contemporary languages finds a new and extensive manifestation in the fifth album of the pianist Andrea Carri, realized side by side with his colleague Francesco Camminati, who has done a decisive contribution in terms of rhythm and synt to the ten tracks of "Shadows" . It grows in the Italian Pianistik. There are many young pianists who decide to look into this world, that has always been linked to the great names of classical music, and who would like to be able to tell their own opinions in a new form. One of them is Andrea Carri, whom we already know from the review of his album "Chronos" and now we will discuss his new album "Shadows". 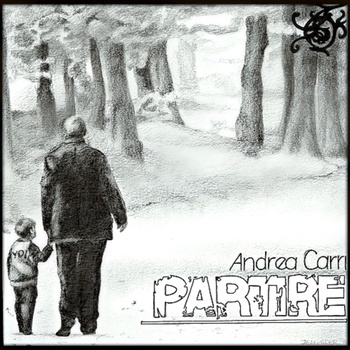 To say I am enamoured with the music of Andrea Carri would be an understatement ... I am utterly besotted with his particular blend of melodic solo piano & neoclassical expression. I've had his new albums "Chronos" - for a wee while now & am captivated by the ease in which Carri presents a melody. 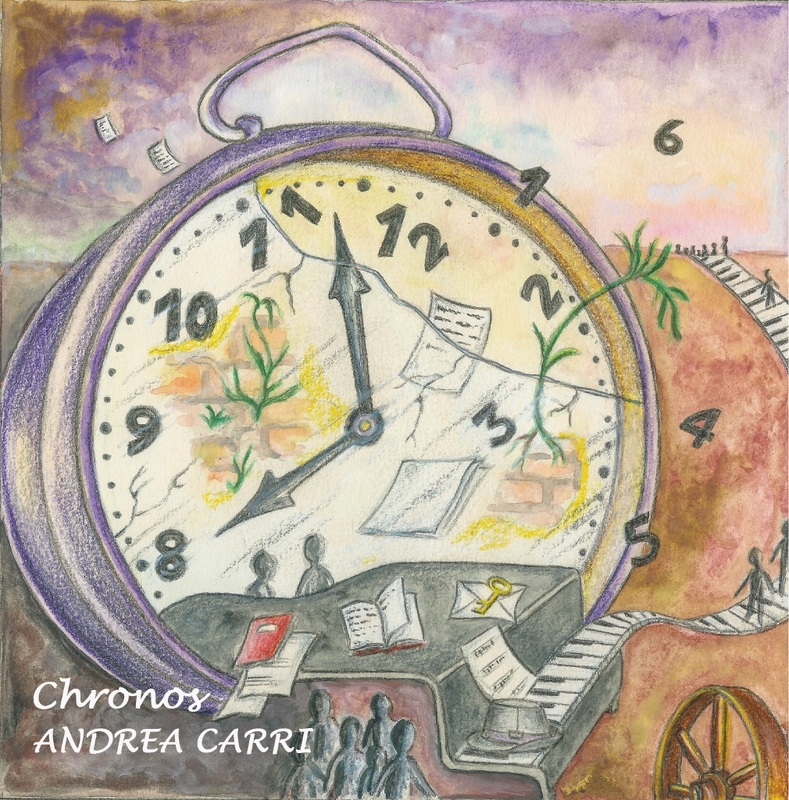 Chronos is the fourth album by Andrea'Carri, pianist from Reggio Emilia, born in 1990. The CD was financed through a fundraising campaign and published by the Irish label "Psychonavigation". The main theme of the album is the time. Die Reise in der Zeit hat begonnen. Dilated times, hourglasses stopped by time and by a nature that allows to sprout even the most thinnest layer of seeds that is left to rest in the sun of a new day, almost like a mystical contemplation that fills the heart of silences that words kills. “Time flies, time flies away... But what is time? Time flies... But something can make us eternal... after a harvest, another one comes”, these words has the pianist and composer Andrea Carri (born in 1990) chosen, to introduce his fourth record work with the title "Chronos". It will see the light on 15 th September with the Label Psychonavigation Records. They’re not melodies as such, but daisy chains of alternation and arpeggiation strung through the air, or descending staircases into deeper states of thought. Review by "music won't save you"
The direct line, that combines the Irish label Psychonavigation with the Italian artists, particularly with the artists from the field of minimalist Neoclassicism, does not stop. The same ideal production process route that a few months ago has trod Bruno Bavota is now being followed by Andrea Carri, twenty-four old pianist from Emilia Romagna who already has considerable experiences, he started to play at a very young age and released already three albums before his newest work "Chronos". Italian Pianist & Composer Andrea Carri presents his latest solo-album effort titled ‘Chronos’. 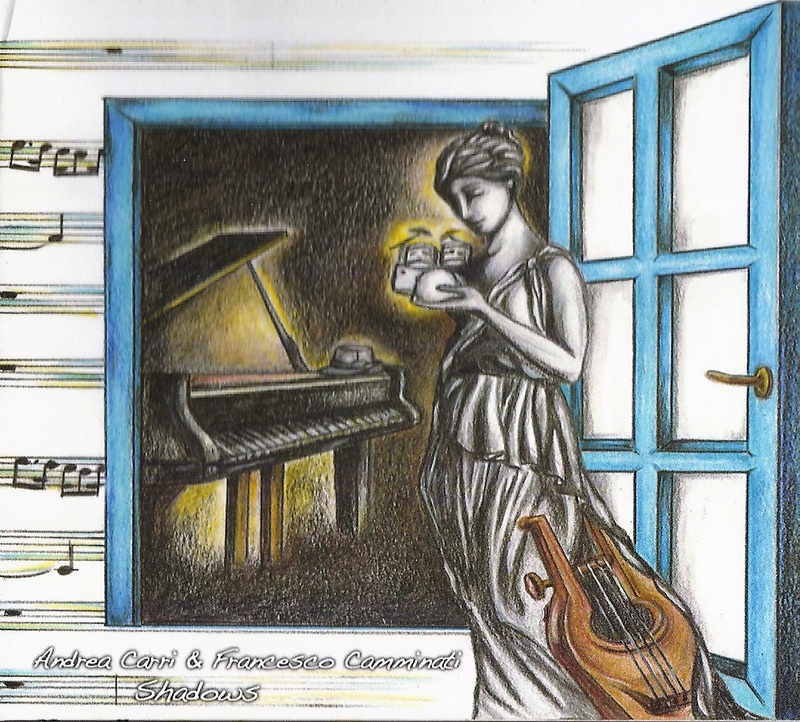 Carri’s latest album showcases more of the classically-styled music we’ve seen before, whilst also offering a few little new creative ideas here and there. There’s a beauty to the music being presented by Carri, which at times includes various other instruments to bring life and character, without actually degrading the music to any degree. Though he's only twenty-four, Italian pianist and composer Andrea Carri already has four studio albums to his credit: 2010's Partire, 2012's Stanze Segrete, 2013's Metamorfosi, and now Chronos, his debut release on the Irish label Psychonavigation. It’s been a productive period for Italian piano/ambient composers, with Luca Ciut and Bruno Bavota both impressing with their recent albums. Andrea Carri is a labelmate of Bavota and one who draws on the emotions of both himself and his listeners via some lovely compositions. That "Psychonavigation" is in love in the Italian atmospheric landscape is now a fact, prove of it is a number of publications from very high quality during the recent months. This release from 2014 offers 45 minutes of modern classical music. Joining Italian pianist are: Carla Chiussi (on violin), Emanuele Milani (on cello), Roberto Porpora (on guitar and effects), Francesco Mantovani (on synthesizer), and Perry Frank (on lap steel guitar and soundscapes)..
Andrea Carri was among the first pianists I met on SoundCloud. Though just 24 years old, Andrea has released four full albums as well as a few singles. He has performed solo and with different bands. Even more impressively, his compositions have appeared on TV and in short films. A fantastic world of soft colors and pastel shades in which a tree is hugging the pianoforte and becomes part of it, sideways runs a brook that is caressing the earth. We perceive notes that are carried by a gentle breeze and accompany one along the distance, giving an idea of the way that has already started, but where still everything is to discover. Andrea Carri is a young and promising pianist and composer from Emilia Romagna, who is also very active regarding his live performances . His genre is an excellent gentle, minimalist New Age music, the melodic sections remind partly of the American school. 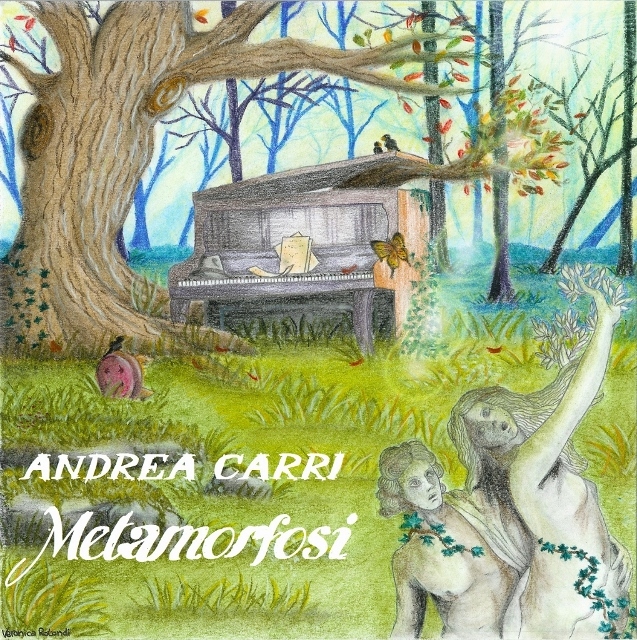 Andrea Carri fascinates for the approach, a forgotten piano in the bush as background for scenes of life to show a perfect partnership between man and nature; walking the paths and swollen rivers of memory, gives emotions to those who know how to listen and then rework in everyday story. Yesterday we were talking about Fabrizio Paterlini and of the modern approach to the Neoclassical (whose leading exponents at the international level, from this point of view, are Olafur Arnalds and Nils Frahm). Here is a young pianist from Emilia Romagna, very talented, who published already his third album, that seems to go beyond the traditional approach. Andrea Carri’s ‘Metamorfosi’ has love for its surroundings. Environmental sounds are used for the benefit of the piano. The playing appears to work off of the environment that it has been placed in going for quiet for the more subdued locations and gentler for those pieces set entirely in nature. Andrea Carri is an 21 years old pianist and composer. He was born in Campegine ( Reggio Emilia). The disk that mainly contains New Age music, describes the journey of life from each of us, you make new experiences and face new adventures, but there are also mischances. Tenacity and willpower are characteristics that are not often to be found, particularly not in the young people from nowadays, who launch into new activities with lots of enthusiasm, just to lose their interest again fairly quickly, especially in moments, where the first difficulties appear.